Two photographs showing the exterior view of the Rexall Drug Store and the Post Office in Alta Vista, Kansas. 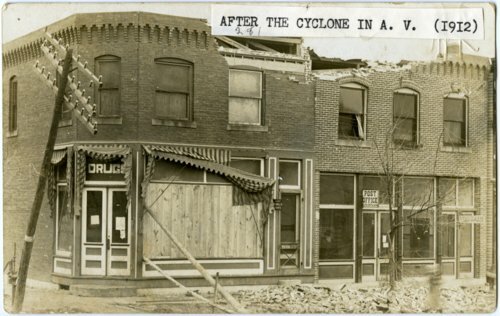 The first photograph shows damage from the 1912 tornado that struck Alta Vista. In the second photograph, two men are visible standing in front of the drug store, and another man is visible standing in front of the Post Office. The photograph identifies R. W. Hull as the proprietor. The sign above the corner door visible on the left side of the picture reads, "Drugs," and the sign above the windows reads, "Ice cream, candies, and cigars." Some advertising signs are partially visible in the window of the drug store. A small sign reading "Post Office" is partially visible in front of the windows of the building on the right.